I received Jellaby: The Lost Monster and some other dinosaur themed books from Capstone Publishing. Jellaby is about a girl named Portia whose life is pretty dull, until one night, she hears something outside! She goes outside to check to see what it is and she finds a little dragon. She names it Jellaby. Portia keeps him a secret until, after an incident, a young boy named Jason finds out about Jellaby. They work together to keep Jellaby safe. Finally, they figure out that Jellaby's real home is through an odd door at the fair. How can they get Jellaby to the fair without anyone noticing? And will they get Jellaby home? I really liked how this book was a graphic novel because I think comics help explain a story better. 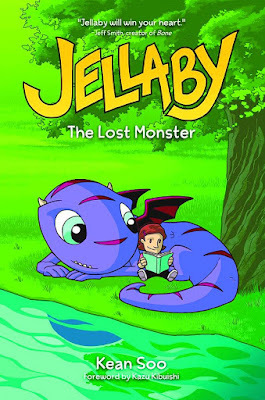 I think the characters are cool, especially Jellaby, because I think it would be awesome to find a real dragon of your own. Also, this story doesn't really end for Jellaby and his friends! It's a cliffhanger, and I really want to read the next one.